We’ve all been there. You’re all up in your kitchen going, “OMG, you guys! I’m about to rock the house with these treats!” And then, bam, that vanilla you thought you were adding to your cookies turns out to be mint. Amiright? No? Just me? And the thing is, I was going for the easiest possible Valentine’s Day cookie solution by using Glutino’s sugar cookie mix. That is hard to mess up my friends, but I did. Or I possibly made it BETTER, which I’m really coming around to now that I’ve gobbled up four heart-shaped cookies with a minty tingle in one sitting. Normally if you’re mixing up Glutino sugar cookies they recommend you just ball it up and bake. But if you want to go at it with a cookie cutter, do what I did and after mixing the ingredients allow the dough to chill for about an hour. Gluten-free flour a surface and a rolling pin, then roll out that dough to about a 1/4 inch thick. Cut into your favorite shapes and bake. If you don’t have any Glutino handy, you can use this recipe wherein I used the Cup4Cup. These were awesome too. 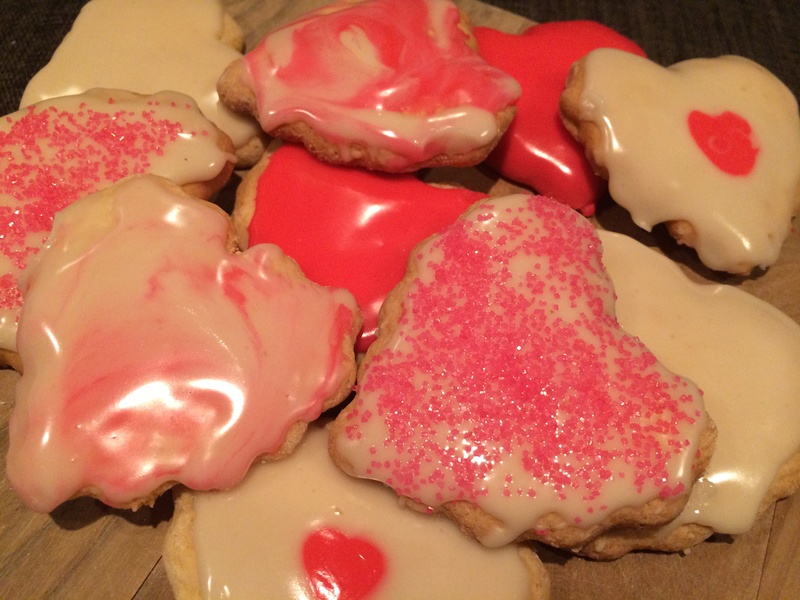 But the best part of my experiment in Valentine’s Day cookies was finally getting the icing right. I love me a buttercream, but butter don’t set. Instead, use a corn syrup based icing and if you want to make it dairy-free, you can substitute almond milk right on down the line. It’s like magic. The thing is, we all know that sugar cookies with icing really means Christmas. And with that mistake-o-mint, these heart cookies totally reminded me of Christmas. Which made me think, “How many days until Christmas?” Because that means, “How many days until I can take some time off with my family and sit around shoving food in my face, and especially that Garrett’s popcorn?” Those were the days. Let’s relive them, shall we? 1. Mix ingredients until completely combined. Separate icing into different bowls depending on how many colors you’d like to use. Use one drop of food coloring per bowl. Tags: dairy-free recipes, gluten free holidays, gluten free junk food, gluten free recipes, gluten-free desserts. Bookmark the permalink. My first baking disaster involved coconut flour and dry, crumbly but fragrent cookies. Glad your mistake turned out tasty! And I do love mint in cookies. Baking disasters can almost always be worse, like mistaking salt for sugar (or vice versa), forgetting baking soda, adding too much baking soda, or neglecting to crack your eggs into a separate vessel only to find one of them was halfway to chicken-hood. Also, mint is delicious and appropriate at any time of year. And now I want cookies. You found a baby chicken in your egg!!!! That would scar me for life. It was ages ago, and pretty scarring at the time, but I got over it. Eggs are too yummy. The funny thing is only my daughter and myself noticed the mint. The boys had not a clue. Thank you so much! I just bought the mix at the store and read the directions, which included nothing about rolling for cutting out shapes. My brain told me chilling and rolling would be fine, but it’s nice to have confirmation from someone who has done it!